Homepage. 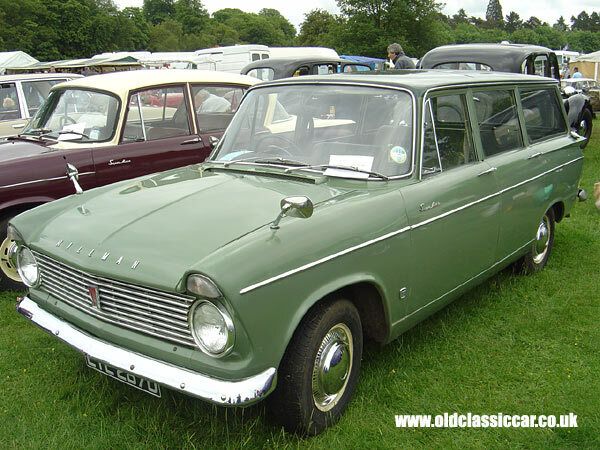 This page: Photo of preserved Hillman at Tatton Pk. Classic Hillman Super Minx estate. Super Minxes are not big survivors in the classic car world and estate versions are getting rare. This particular estate dates to the mid 1960s and has an earlier Super Minx saloon alongside. Both are products of the Rootes empire. Hillman Books Whether for the Super Minx estate as shown below, or any other type of Hillman, it is worth having a look on Amazon for books, DVDs, Videos etc. Have you seen today's eBay auction listings for the Hillman Super Minx estate? Super Minx estate on display at Tatton Park, Cheshire. If you have any more info or restoration stories about this particular Super Minx estate, or Super Minx estates in general, I'd really like to feature it on oldclassiccar. I took all these photos at the classic & vintage show held at Tatton Park, in June 2005. The Hillman shown above was one of several hundred vehicles held in the grounds of this National Trust property. Some vehicles appear at a number of local shows throughout the season, so I've picked my favourite 95 photos from this particular old-car gathering. The other 94 pictures can be found on the main Tatton Park car show page. If I missed your car out, then I apologise! If the Super Minx estate featured here is yours then I hope you're pleased to see it featured here. If there were other Hillmans at the show which I've included in this image gallery, the links will be further down this page.